Whatever the occasion, Sarah's designer florist deliver all Island. Whether you want to say "Happy Birthday", "Congratulations", "Sorry", "Get Well", "Thank You", "Happy Anniversary" or just "I Love You" say it with a beautiful bouquet or arrangement. We import all our fresh flowers direct from Holland. 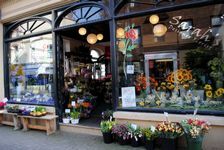 Our shop is brimming over with beautiful fresh flowers and a wide selection of foliage and flowery plants. We also stock a very wide selection of silk flowers, pottery and gift items. View a selection of our flowers online through the menu on the lefthand side. Call or visit us to discuss your special requirements. We can also send flowers worldwide via eFlorist.